I would like to greet you from my heart. My name is Alexander Goeb. I am a journalist and have financed this exhibition with the help of several foundations. 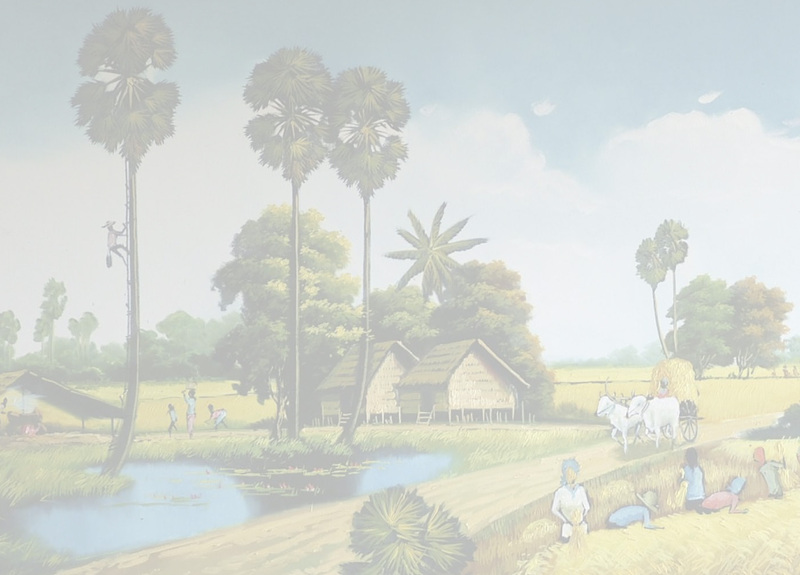 The exhibition shows a small part of the history of the murderous state of the so-called Democratic Cambodia that for a short time: three years, eight months and 20 days - existed. Many people here know more than I do over this time. some have suffered, and have lost relatives. Some will suffer up to this day. Whether they were victims or whether they were both victims and perpetrators. Some of the people who supported the state and its ideology still exist. the torture expert Pol Pot has been condemned, four other prisoners await their sentences. Why does a journalist from Germany visit Cambodia again and again for more than 30 years, to interview people and send their answers in radio programs and newspaper reports? Now that I'm here in Cambodia I will turn 71. A brave age. I wouldn't have thought I would turn so old. But that is how it is. As a reporter, I traveled in many parts of the world. Almost always, my travels had to do with wars - with "normal" wars and with wars in the mind. The war in the mind is a permanent companion to a "hot" war with bombs and grenades. I was in Kurdistan and Lebanon, in almost all regions of the Balkans, in Vietnam at the end of the border war with China. But none of my travels shook me up as much as the war in 1979 in Cambodia. I had won a journalist's prize for a report on some German youth between 15 and 18 years old who resisted the Nazi regime. They went with weapons against the highly weaponized regime. They were arrested and - without trial or a condemnation, they were hanged as a deterrent to others. The prize was a trip to Vietnam. In Hanoi the people asked me if I would like to attend the tribunal against Pol Pot and Ieng Sary. I agreed. I flew then to Phnom Penh and spent six days in a deserted city, full of rubble and a few people who crawled like ghosts through the city, protected by Vietnamese, because without the Vietnamese the Pol Pot regime would have gone on committing crimes against humanity. There were 29 international journalists attending the tribunal. I was the only one from the then Federal Republic of Germany. At that time, in the Chaktomuk Theatre on the River Tonle Sap, where the tribunal took place, men and women, old people, youth and children took the stand. They often stared straight ahead and reported like automatons about the terrible events that cost the lives of two million Cambodians, nearly a fourth of the population. During some of the testimony there was a terrible groaning throughout the courtroom when children reported how their parents were killed before their eyes. Six days long I was in a dead city, where thousands of former residents waited outside the gates so that they could again live in the area where they had been driven out. The atmosphere was very strange. Between palm trees and small banana plantations, 400 children gathered. I have never seen such still children. It was midday. The children sat in a great hall and eat out of a bowl of rice. None of them spoke. They eat. They could, they dared to eat again. From far distant provinces they came, their parents dead, from hunger or murdered. Few made it to Phnom Penh. The smallest made it because they needed the smallest amount of food. Many children were ill, some had very bad wounds. The new president Heng Samrin welcomed the arrival of the journalists in the - today - luxury hotel Le Royal, at that time a rundown building, where monkeys and geckos ran rampant. He presented his new government and his idea of the new Cambodia. Heng Samrin, most of you here know that he was a general of the Khmer Rouge in the southwest region and escaped to Vietnam to avoid being executed in S-21. Like others also. At the press conference I sat directly across from the now Minister President Hun Sen, a small thin young man of 28, the new foreign minister. I couldn't tell if he was looking at me or staring into space. It was almost funny, until I realized that he had a glass eye, that looked in the other direction as the healthy eye. He had lost the eye during the war. I was in a million-resident city that wasn't anymore. Before, Phnom Penh was a metropole with international flair. That was no more. Only poverty remained. And the poverty was even larger. And then the many farmers who had joined the Khmer Rouge so that they could fight for a society with more rights for people. From the revolution that drove many Khmer after the putsch against Sihanouk into the arms of Pol Pot, but the regime turned into an apocalypse of crimes against the people of this wonderful country with its fascinating history. A Mexican journalist asked me: "Listen, you come from Germany. Tell me if you think the Pol Pot regime is comparable to the Nazi regime. Then, I said yes. Certainly, the genocide in Cambodia between 1975 and 1979, is, after the holocaust, the worst crime against humanity in the 20th century. What happened after that? I reported in Germany about what I had heard and experienced. But there was little interest. The Cold War was going on, and in Cambodia the wrong freedom fighters had liberated Cambodia from the terrorist regime. And that was Vietnam. Vietnam occupied Cambodia, so that they could save Cambodia from the Khmer Rouge. Maybe ulterior motives played a role in the decision to march into Cambodia. One reason was that the Khmer Rouge had raided border villages for years and left only destruction and death. For the main part of the Western press, the tribunal in Phnom Penh in 1979 was a Vietnamese propaganda show. The enmity against Vietnam, who later ensured the USA a historical downfall that led to the USA, China and Thailand starting a civil war against the new government - with help of the Red Khmer, which, in the eyes of the West, was a marionette Vietnamese regime. And the worst was that the UN accepted the Khmer Rouge as representative for Cambodia in the United Nations. This unbelievable situation ended at the end of the 80s, as Vietnamese left Cambodia and peace talks in Paris began. In part of the exhibition here you will see photos. They are from the painter Vann Nath, who Minister President Hun Sen, as Vann Nath was very ill, named him a "national treasure from Cambodia." Another part of the exhibition are photos from the photographer Heng Sinith. These also have to do with the terrible history of Cambodia. Torture and degradation of people in Tuol Sleng is, since his release in 1979, the life theme of Vann Nath. Photographer Heng Sinith survived the Khmer Rouge time as a young cow herder. Many of his relatives died. After studying theater science, Heng Sinith decided to become a press photographer. He works for an AP agency today. His part of the exhibition are photos of the "little murderers." They show the people in their everyday situations, mostly as harmless rice or vegetable farmers. Included are also black and white photos of these people taken by Khmer Rouge photographers, which are today archived in the Cambodian documentation center, or DC-CAM. these photos were taken between 1975 and 1978. In 2005, I traveled with Heng Sinith. I wanted to speak to some of the "little murderers." between houses on stilts, sugar and coco palm trees as well as tamarind trees and rice fields. Somewhere on the side of the road was the house on stilts of Lo Sim. I met a slim woman with a still face and sad eyes. She told me that the Khmer Rouge kidnapped her out of her village. She fled often, she wanted to go back to her mother. She was captured and put into jail. She came into the army and was trained on weapons. She was 17 years old. Although she was a soldier of the Khmer Rouge, she still got, like most of the other soldiers, just roots of papaya trees or banana plants to eat. Every 5 days, they got a rice soup. In the meantime, around me (with my microphone) and Lo Sim a large group of relatives gathered. Some of them looked scared, others nodded their heads when Lo Sim talked. Sometimes Lo Sim was still, looked into space, then found her way back and spoke further. She says she is afraid of death and has bad dreams. She is also furious. Medicines help some. There are no secrets in the open houses on stilts for the Khmer. The children and relatives were glad that Lo Sim spoke to me. When she talks, she feels better, they said. During the last days, she spoke more often and wasn't so often furious. Lo Sim was, at the end, group leader for the Khmer Rouge. She is victim and perpetrator at the same time. She belongs to the few people in Cambodia who was able to take part in a trauma therapy. Another of the "little murderers" is a man called Him Huy. Vann Nath says about him, that he beat at least 2000 people on the killing field to death. The now 55 year old man works today as a vegetable and rice farmer. He is married and the father of nine children. Him Huy's house wasn't easy to find either. Him Huy was responsible for transporting the tortured people to the nearby execution field Chhoeung Ek, the killing fields of Phnom Penh. A small, muscular man comes to meet me. He requests me to take place on his bamboo mat. That this man is free, no one understands except the Red Khmer and government of Cambodia. In the middle of the 80s, Him Huy was arrested. Then, it was enough to free him that he said he had nothing to do more with the Khmer Rouge. All of the people who were died in Chhoeung Ek were beat to death with blows to the back of the neck. Then their throats were cut. After they were dead, their chains were removed. That was the report of Him Huy to the International Tribune. Him Huy was a witness like Vann Nath, who was almost his victim. In the exhibition, there is also a dialog between Him Huy and Vann Nath, who met coincidentally during a trip to the one-time torture prison and museum today. Besides that, I have added to the exhibition text and portraits of the inmates and Pol Pot, and I describe shortly the Tribunal. Next to the top recipient of orders, the torture chief Duch, who has been sentenced, five other people are portraited. Four of them have been in the jail of the International Tribunal in Phnom Penh. The fifth person is Pol Pot. He died in 1998 in his jungle hideaway in northern Cambodia. It will hardly happen that further mass murderers like Him Huy will have to answer to a judge, even though it would be possible according to the tribunal contract. But the Cambodian government has done everything to prevent further indictments. Today, many, many people in Cambodia suffer from deep traumata. Even young people who were born after the liberation are victims too. Scientific examinations have shown that the latent violence spread among Cambodian youth is connected to the genocide and the fates of parents and grandparents, and the fact that many survivors were not only victims, but also perpetrators. Whoever has occupied himself or herself with the situation in the 3 years, 8 months and 20 days of the Democratic Cambodia asks: How could that happen? How should I try to answer? The excesses that happened, the absolute pitilessness against people, I think it can only be explained with an extreme paranoia, a pathologic surpassing of all norms of society, that cannot be righted by any and all defined ideology. People know too, that many cadre of the Khmer Rouge, who hoped for a better and righter society and who engaged themselves for that, lost their lives for their idealism. I could remind you of Hu Nim, former Information Minister, who was beaten to death on the killing fields near S-21, and also Hou Yuan, also a minister of the Khmer Rouge, who, after he resisted the deportations, disappeared without a trace, like many others. And another story, possibly a story that can explain the unexplainable. I heard of a woman who lived for ten years with the Khmer Rouge, a Frenchwoman called Laurence Picq. At the end of the 60s in Paris, where she was studying, she met a young Cambodian and fell in love with him. They married. They had heard of the extreme injustice and the brutal civil war in Cambodia. She decided with her husband to fight for a better society. Many did it then. Laurence was very consequent. She went with her husband Sikoeun, who was an avid worker for Ieng Sary, after the putsch against Sihanouk to Peking, where they worked with Sihanouk to liberate Cambodia from the Lon Nol regime. She learned Chinese and Khmer and worked as a translator. Then came 1975 in Phnom Penh. Laurence Picq experienced very near the paranoia of the people surrounding Pol Pot and Ieng Sary, including once well-thought of gentlemen Khieu Samphan, as well as Nuon Chea, Ta Mok, Son Sen and others. Her husband distanced himself more and more from his wife, because he was afraid of problems with his career because he was married to a foreigner. Her children were taken from her. Even though she felt connected to the Khmer Rouge, she experienced a long time of hunger, illness and fear of death. In 1980 she managed to flee through the Cambodian-Thailand border and after that, went back to France. With my wife Bettina Eichhorn, who was always with me on my travels since 1992 and has helped me with research and interviews, I visited Laurence Picq in 2008 in French Dijon. She works now as a psychotherapeut and suffers with one of her daughters who survived the Pol Pot time with problems of the soul. "Yes," she said, "The ego, the personal identity of a human being, was supposed to have been eliminated by 1976. People should have no personality, no personal thoughts. One didn't need names, no humanity at all. Since 1978, the goal was to control the unconscious and the battle against the so-called inside enemies. I was accused of working for France, because I was a Frenchwoman, I was accused of spying for the Americans because I had my matura. I was accused of working for the Russians, because my father was a worker, a spy for the Vietnamese because I liked Vietnamese and a spy for China because I liked Chinese." Laurence Picq experienced the same paranoia that led people to be killed, beat to death or shot to death because their hands were too tender, because they wore glasses, because they spoke a foreign language. Liability for the whole family reached excessive parallels. Maybe this is not enough to explain the apocalypse of those 3 years, 8 months and 20 days. For myself and those who have supported the Meta-House of this small exhibition, I have always felt near to victims, not only in Cambodia. Maybe I can understand better because of my own history. When I was born, the Nazis had just begun World War II and marched into Poland. Less than two years after that, the war came to Germany. Mass bombing of German cities by the Allied Forces began. I survived the fire hail with my mother just so. The house we lived in was bombed to the ground. We survived only because we were in the cellar of a cloister across the street, where we found refuge, you could say, in a pagoda with very thick walls. I remember when my mother pushed me in my baby buggy through streets with fire storms and house facades falling down. And I know since this time I had asthma. In regular intervals, I couldn't get air. Today, this has developed into ephysemia. The capacity of my lungs is 20 percent. That is not much. But that wasn't all. My father had to go as a soldier. My mother moved with me to Schlesien, a German region then but now Poland. She came from there, where 1942 there was no war and no bombs. Three years later, everything was different. The army of the Soviet Union was on the banks of the River Oder. My mother, my younger brother and I, five years old, were part of a fleeing people trying to reach the west, threatened by Polish partisans and regular Soviet troops on the lookout for Nazis who liked to hide themselves among the fleeing people. Once we were almost shot. We suffered hunger and I, always, shortness of breath. That is my small story as the author of this exhibition and why I have done it. With this exhibition, nobody earns money. It costs money. That it was possible at all, I thank the Hamburg Foundation for Science and Culture. In Germany, the exhibition was shown - in the German language - in 2009 and 2010 in twelve cities. It was shown in city halls, libraries, universities and culture institutions. I wish for the exhibition to remain in Cambodia. Maybe it can find a place in the genocide museum. Maybe Samdech Hun Sen can remember the small, the long-haired journalist who sat across from him and was irritated by his glass eye. Maybe he can say something that will provide a place for the exhibition in Tuol Sleng. Thank you very much for coming. I hope I have explained to you why I always come back to Cambodia and, at the end, this exhibition could be presented.